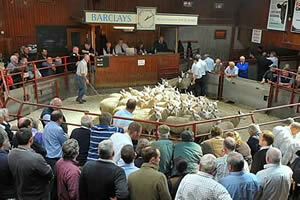 The Cumberland & Dumfriesshire Farmers Mart had forward 5,467 Store Lambs (including 1,424 Hill Cheviots) at their Weekly Sale at Longtown on Tuesday 8th November, 2011. Store lambs were less numbers, trade very firm. Top was £75 for Texels from Wanwood Hill, £74.50 Shield Hill, £71.50 Rinnion Hills and Haswellsykes. Suffolks £70 Lamberton & Clifton on Bowmont, £68.50 Nirvana, Hillview & Hallburn; Charollais £69.50, £69 Hallburn; Cheviot Mules £68.50 Clifton on Bowmont; Greyface £70 Cooks House, £68.50 Tecket, £67.50 Greyside; North Country Cheviot £71.50 Clifton on Bowmont; Blackfaces £70 Blackburn, £64.50 Gatehouse, £63 Horseholm; Herdwicks £58.50 Ramshope; Swaledales £46.50 Lilswood Cottage, £44.50 Laverhay & Bayles, £42 Ouston. Hill Cheviots were a smaller entry with best lambs expensive. Top was £65 Drycleughlea, £63 Girnwood, £60 Granton. Cast ewes to £79 Clifton on Bowmont, hill types £61 for Blackfaces from Wardrew. At the final sale of breeding sheep a good entry for the time of year met a exceptional trade. Top was £90, £86 for 2 crop Swaledales from The Bayles. Hill Cheviots £70 Blackburn £67 Drycleughlea; Swaledales £55 Nettling Flatt who also sold Herdwicks at £44. Blackfaces £57 Bayles , £55 Nettling Flatt. Shearlings to £96, £88 for Blackfaces from Linton Gate. Cheviot Mules £95 Dykecroft; Swaledales £74 Greeneycleugh. Ewe lambs to £80 for Greyfaces from Silloans; Texels £77, £70 Patties Hill.